When wrapped against me, she would settle with the gentlest of rocking, a little swaying or even just a potter around the house. And so, in a plain brown wrap, she nestled into my chest. For us, this practise was simply a nameless necessity. Back then, I didn’t even know that babywearing was a ‘thing’. And far from simple block brown stretch fabric, the sheer luxury of materials and designs now available wouldn't seem out of place splashed across the pages of Vogue. 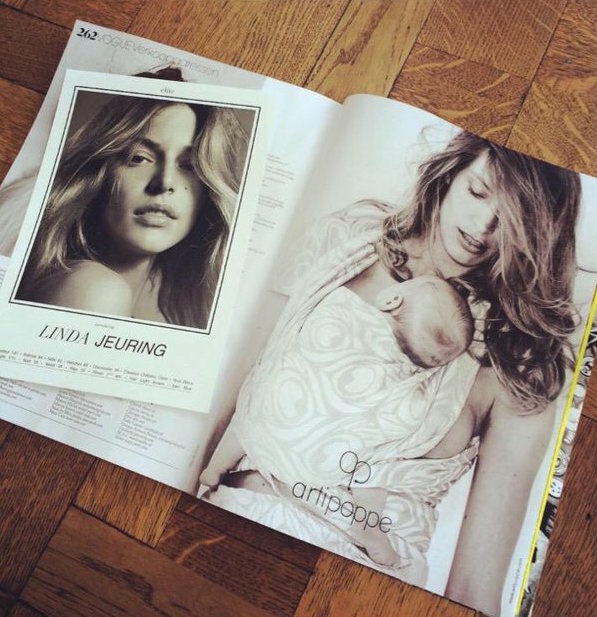 In fact, high-end slings such as Artipoppe have actually already graced those elusive pages, wrapped around the babies of supermodels...it seems that slings are just as much a fashion statement as they are a practical component of our parenting toolkits. 1. Babies that are worn are happier. Evidence suggests that carrying our babies is directly correlated to decreased crying and fussing. 2. Babywearing helps meet an infant’s physical needs. Scientists are linking the gentle movement that babies experience during babywearing to improvements in breathing, growth, physiological regulation and motor development (read more in Sears' book, The Attachment Parenting Book : A Commonsense Guide to Understanding and Nurturing Your Baby .) To wear our babies also encourages increased feeding frequency and heightened contentment. 3. Babywearing helps meet a child’s emotional needs. Wearing our babies provides the comfort and security needed to help foster healthy attachment relationships. 5. Babywearing increases bonding. Babies that are involved in their caregiver’s activities are taking the role of passive observers. In this role, babies are able to snuggle into mom and focus on her familiar scent and heartbeat, or take note of the outside environment from a safe, secure and attached vantage point. 7. Babywearing gives us more freedom to explore. Trails that would leave a stroller stuck in the mud (literally) are more accessible to explore when baby is strapped safely to your back, or when little toddler legs get tired half way along the route. My due date is fast approaching and with it, comes a million uncertainties. Yet one thing is clear in my mind. I will wear my son. I will wrap him in cloth and trust in this age-old practise that is now being supported by science, common sense and fashion. And while I may not be 'Vogue-ready', I'll honour every beautiful extra inch and glistening tiger stripe as I carefully position my newborn against my body. Because whether they are worn during muddy hikes or through glamorous photo shoots, our babies only care about one thing: being close to mama. I LOVE babywearing. It wasn't called that yet, but thanks to Mothering Magazine, there were many pictures of mothers and babies in slings. Mine was called a Snugglie and we used it all the time. This was with my last child and 38 years ago! Makes for super close bonding and just so comforting to baby and mom. We also practiced bed sharing which turned out to be a wonderful experience for us all. So glad to see these things coming back into the fore of childrearing. In that respect, we are also practiced attachment parenting. Although we were convinced of these practices at the time, it's nice to say that all our children have turned into nurturing, caring, independent adults (and friends!). I love this comment, MarryAnn! Such wonderfully uplifting words!